My daughter wanted to watch Masterchef on TV (some bigger kids at her school were doing a Masterchef night and cooking for their parents…Ithink thats what brought this sudden interest on) and I told her she had to go and have a shower. By the time she got out she wanted to watch it but it had finished. I don’t think she believed me as she stormed off stomping her feet. Anyway my hubby got up to do something in the computer room, next to my daughters room and suddenly burst out laughing. I had to go see and this pic is what we found stuck to my six year olds door! She was asleep in her bed, and obviously not impressed with me. Oh I’m so looking forward to the teenage years – NOT!! 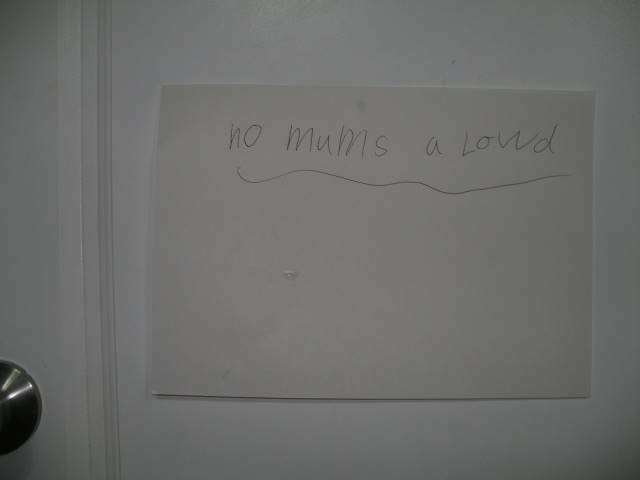 By the morning she’d forgotten about it, of course, hugs all round and a new sign appeared on her door: “NO BOYS A LOOD”.